Welcome to Alabama Gulf Coast Vacation Rentals LLC! A beach vacation on the Alabama Gulf Coast is a family affair. 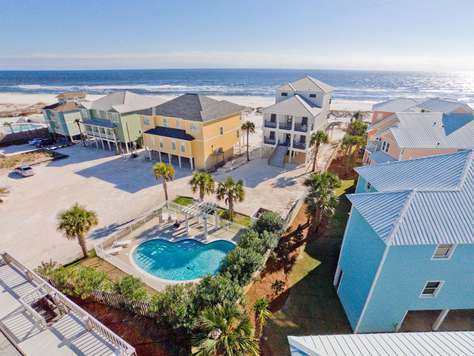 Families have called Gulf Shores and Orange Beach their home-away-from-home for generations. While the white-sand beaches and clear Gulf waters beckon children to build sandcastles and teenagers to hone their skim board skills, parents watch on as their family files memories away. With beach activities like volleyball, parasailing and boogie boarding, there’s plenty of fun for all ages, from toddler to teen. When you’re not soaking up the sun, amusement parks featuring go-kart races and miniature golf offer a fun way to spend the day. You can even get your adrenaline rush on the Gulf Coast’s mile-long zip line course or rushing down a waterslide. A beach vacation is also the perfect time to introduce your family to charter fishing in Orange Beach, home to the country’s largest artificial fishing reefs. Great Location - Gulf-Front Home w/pool - "Heavenly Sunrise" - Sleeps up to 14. "Crews Quarters" Gulf Front Home w/ private Pool.